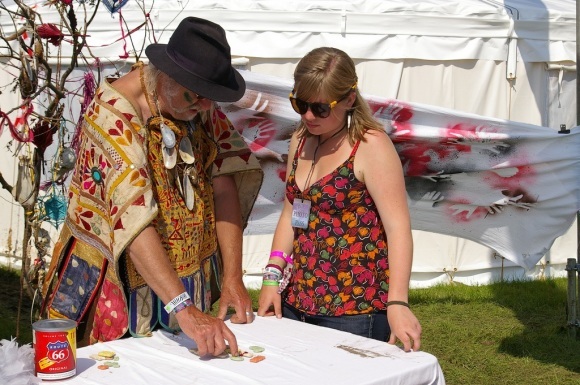 Listen to this interview with Dr Henry Droselda – our shaman recorded at Secret Garden Party. Henry describes his five years living in Papua New Guinea, discusses the role that animals play in Shamanism, and his encounter with a grouse that later ended up on his Shaman Tree. There is a later interview with Dr David Luke talking about the big 5 Ds in shamanism – Drumming, Diet, Dancing, Drugs and Dreaming (as well as near death experiences). Have a listen…. Henry does Shamanic fortune telling for the press. « Ain’t no stoppin us now – we’re on the move!